Offers complete AC and phone line surge suppression for comprehensive protection of workstations, desktop PCs, telecom systems and other sensitive electronics. 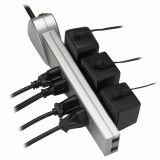 Seven total outlets and 7-foot cord with space-saving angled plug and automatic cord management. Diagnostic LEDs to warn of wiring problems and suppressor damage. 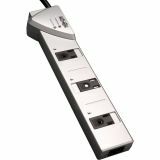 Tripp Lite TLP707TEL Surge Suppressor, 7 Outlets, 7 ft Cord, 1080 Joules, Silver - Surge protector features protection for every piece of electronic equipment. Unique design accommodates bulky transformers without blocking remaining outlets. EMI/RFI line noise filtering. Diagnostic LEDs warn of potential power problems. Three designated transformer plug outlets offer convenient protection of desktop computer equipment and accessories. 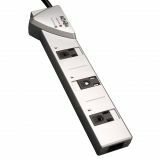 Automatic shutoff cuts power to outlets when the protection circuit has been compromised.